Venue Space Rental for: Weddings, Vow Renewals, Elopements, Rehearsals, Location Scouts, Photographers, Movie Industry, Corporate Events, Meetings, Guest Speakers History Established in 2014. The historic Cave Creek Chapel's stunning landscape and elegantly restored interior offers couples an intimate wedding venue with awe-inspiring views. 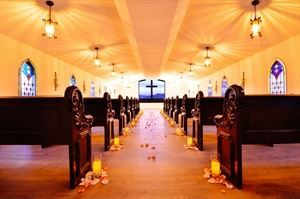 With intricately carved pews, stunning stained-glass windows, and elegantly restored Bride and Groom suites, the historic Cave Creek Chapel is elegantly set for weddings, vow renewals, elopements, baptisms and christenings. Surrounded by desert mountains, the panoramic views and historic interior make the Cave Creek Chapel an awe-inspiring venue for any couple, setting the stage for a truly romantic ceremony. The Chapel is Non-Denominational and can accommodate up to 80 guests. It also offers a variety of celebration services, such as: Officiant, witnesses, referrals, decorations, and assistants. This one-of-a-kind venue is also available for filming and location shoots.